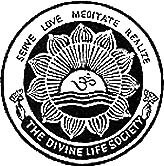 The Crest of the Divine Life Society symbolizes the synthesis of the four great paths to God-realization, viz., karma yoga, bhakti yoga, raja yoga and jnana yoga. As the Society stands primarily for the propounding of the great system of yoga in all its methods, it has adopted an insignia which is indicative of practical spiritual life. The four mottoes in the Crest, viz., SERVE, LOVE, MEDITATE, REALIZE, represent these four yogas, respectively. In the Crest, the two hands that offer a lotus symbolize the dedication of all action as an humble offering to God, which is the way of karma yoga, by which attachment to work is severed and duty is performed with devotion. Also, the firm grip of the hand over the lotus symbolizes that one who is established in karma yoga, in its real sense, has within his grip the yoga of synthesis, the practice of which is called 'Divine Life'. The waves of the ocean shown in the Crest represent the sublimated emotions of the devotee on the path of bhakti yoga whose affections are transfigured in love of God. The waves of bhakti surge from the ocean of the devotees' God-loving heart. The petals of the lotus forming in periphery of the Crest represent the path of raja yoga by which one gradually transcends all the psychic levels or centres, whose form is akin to that of a lotus. The chakra or the energy-centre in the middle of the eyebrows is the main operational centre for meditation in raja yoga. The rising Sun, with 'OM' in its Centre, represents the dawn of spiritual Wisdom and Realization of the Atman through the practice of jnana yoga. As the system of raja yoga combines some aspects of bhakti and jnana, the ocean and the rising Sun are shown as enclosed within the lotus. This is the Integral Symbol of The Divine Life Society.